An inspirational Yorkshire man has set himself a challenge of covering over 200 miles in a wheelchair, with the aim of raising funds and awareness to improve accessibility in the UK’s countryside. Roy Taylor, who works for Europe’s largest wildlife conservation charity, the RSPB, was diagnosed with Motor Neurone Disease in September last year. Although still able to walk a few yards with the aid of a stick, he now relies totally on the use of a wheelchair for even the shortest of walks. His experiences have highlighted the issue of accessibility for people with mobility problems in the great outdoors, a subject that the RSPB has recognised the importance of and been acting upon, for many years. 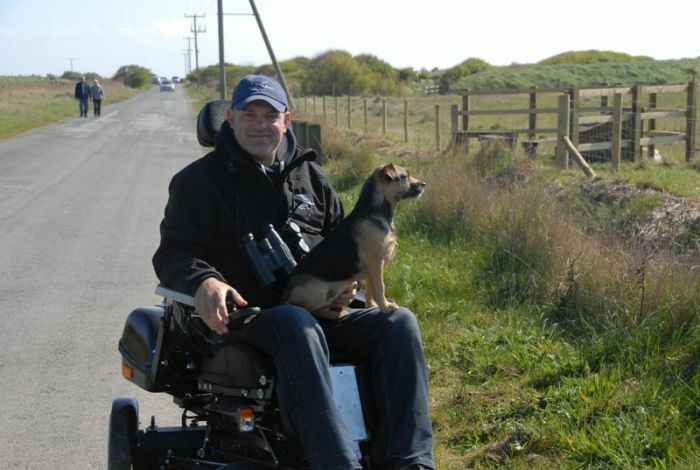 To raise funds to transform some of the RSPB’s nature reserves, Roy will be taking on a coast to coast wheelchair challenge, from Southport to Hornsea. While unable to control what happens in the wider countryside, Roy is in a position to further improve on what happens on RSPB nature reserves. Over the next year, with the help of previous audits undertaken to assess the accessibility of our reserves in northern England, Roy will be able identify any outstanding or additional actions for change that we have not until now, had budget or staff resource to immediately fulfill. These range from actions that benefit very specific user groups, such as installing wheelchair friendly access points, to measures that will benefit everyone, including those with access needs, such as better views from hides. Starting on Saturday 24 May, Roy will cover 215 miles along the Trans-Pennine Trail, aiming to finish on Tuesday 3 June. All of the money raised by the wheelchair challenge will be spent directly on implementing the changes. To help Roy reach his goal, make a donation at www.virginmoneygiving.com/roy215miles or to find out how to take part in the challenge, contact him at roy.taylor@rspb.org.uk. Be the first to comment on "Coast to coast wheelchair challenge"